Vol. 7: No. 11 - What Are People Saying About OPC Short-Term Missions? Vol. 7: Special Edition No. 8 - Hurricane Michael: OPC Spared! Vol. 7: Special Edition No. 3 - Florence Update: Stay Tuned! Vol. 7: No. 5 - Summer Teams are Filling Up! Vol. 6: No. 10: Are You Thinking About Short-Term Missions for 2018? Vol. 6: Special Edition 9: Hurricane Relief: A Triple Whammy! Vol. 6: No. 6: Summer is Here! Vol. 6: No. 2: Can Your Church Use a Team? Vol. 5: No. 8: Rejoice in What the Lord Has Done! Vol. 5: No. 5: On the Road Again! Vol. 4: No. 10 - It's Thank Offering Time! Vol. 4: No. 8 - Let Them Sing! Vol. 4: No. 1 - Would You Invite a Team to Come? Vol. 3: No. 11 - Give Thanks! Vol. 3: No. 2 - Can Your Church Use a Team? Vol. 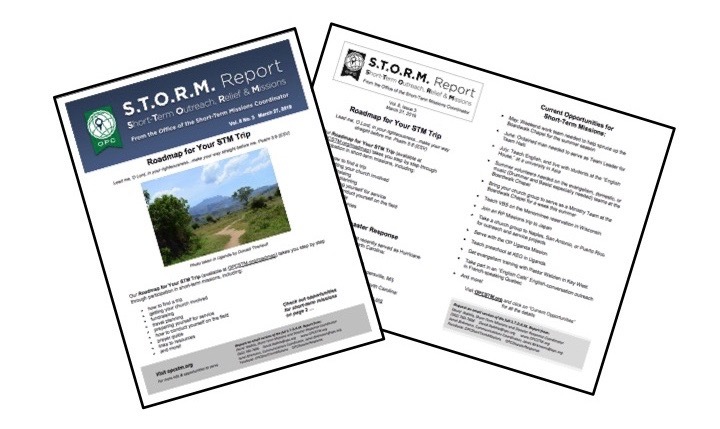 2: Special Edition - What is Our Response to Tornado Devastation? Vol. 2: No. 4 - Lined Up to Serve This Summer? Vol. 2: No. 1 - Short-Term Opportunities Abound in the OPC!